Does this sound familiar? It’s a pretty common problem. Starting a social business, or any business for that matter, can be a daunting prospect. Don’t worry, this is a problem we hear about a lot and we’re here to help. This series of tutorials will help you organize your ideas and get your project off the ground. Step one: defining the problem your project is going to tackle. Okay, that step one may still be a bit intimidating. Let’s break it down a bit more. Step one of step one if you will. 1. Finding the root causes. It all starts here. What are the underlying issues of your target social issue? If your problem is simple, it would likely have been fixed already. What makes your problem a problem? Take childhood obesity for example. The issue is complex. On the one hand, access to junk food at home, at school, in between meals, etc. is an issue. On the other hand, lack of exercise can be a contributing factor, even if the child’s diet is healthy. Lifestyle choices, medical issues and genetic predisposition can also be contributory factors. Which of these factors is your project going to tackle? Education around healthy eating is a sociological solution (changing consumption patterns). Targeting junk food in schools, however, is more economic in nature as you will be altering distribution channels for junk food companies. These are two separate responses to the issue and will result in two different social projects. Knowing your clients and how to respond to their needs is important for any business. For a social business however, understanding the needs of your clients and the complexities of your target problem can be much more difficult. Getting to the root causes of the issue and targeting your solution can help increase the impact of your social business greatly. 2. So now you have a target, but what’s the cost? Every social problem has costs. Monetary costs, societal costs, environmental costs, etc. Understanding these costs will help you to better shape your solution. Direct costs are associated with direct payments that would not be required if the problem did not exist. For example, health care costs due to pollution, unemployment benefits due to high unemployment levels etc. These costs are paid directly. Indirect costs are more subtle and may not be immediately associated with the social problem. These issues are not something a traditional entrepreneur usually concerns himself with. These are not topics that are usually discussed in the private sphere in general. The cost of a holiday for a family does not usually include the environmental costs that are created by Club Med resorts. Social problems on the contrary are often defined by the cost of inaction: if we do nothing, how much will the problem end up costing? When answering this, try to look beyond the obvious. 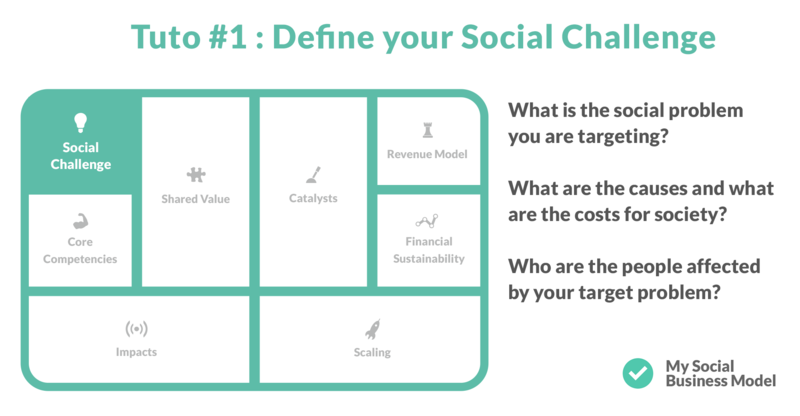 Your social project may have a defined target but are any others impacted? Social problems have consequences for many different actors. Obesity affects not only those who are overweight but also parents, teachers, the medical system, insurance companies, extended care and more. All these stakeholders are implicated in the ecosystem surrounding the issue of obesity and all should be considered in your social project. 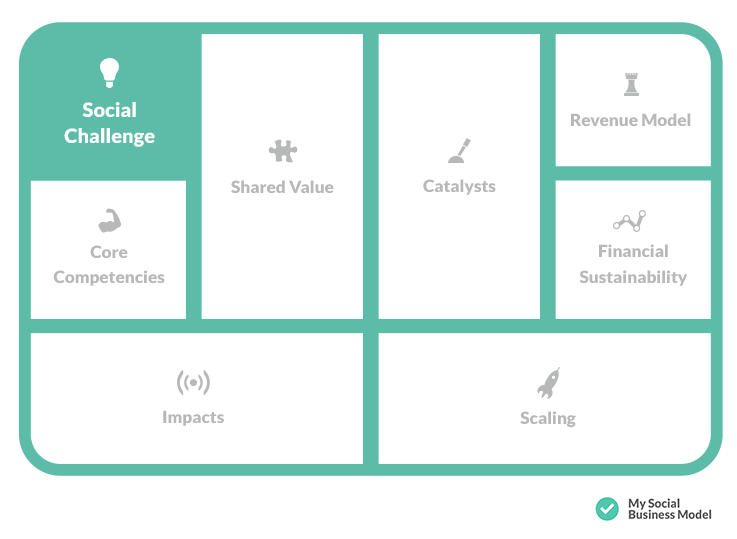 All of these considerations were in the backs of our minds when we designed the ‘Social Challenge’ section of MySBM. Understanding the issues is the first step toward the successful launch of your social business. Were these questions helpful and relevant for you? Continue your project by getting started with MySBM! Our next tutorial will focus on defining your mission including determining the beneficiaries, stakeholders and others who are implicated in your business that you decided upon in this tutorial. You can also continue to follow our tutorials in the Tutorials section of our blog.